Not too long ago, I was looking through our map collection with Andrea Renner, one of the Museum’s Andrew W. Mellon Post-Doctoral Curatorial Fellows, who assisted curator Hilary Ballon on the The Greatest Grid: The Master Plan of Manhattan, 1811-2011, on view at the Museum through July 15. We came across the map below. I’d seen it before, but been puzzled by the what it was meant to depict. Map of Intersection of Spring Street and Varick Street, ca.1850, in the J. Clarence Davies Collection. Museum of the City of New York. 29.100.2984. The map shows the intersection of Spring and Varick Streets. A barricade of sorts has been erected at the west side of the intersection, running across Spring Street, and two figures are fighting in the middle with what appear to be swords. 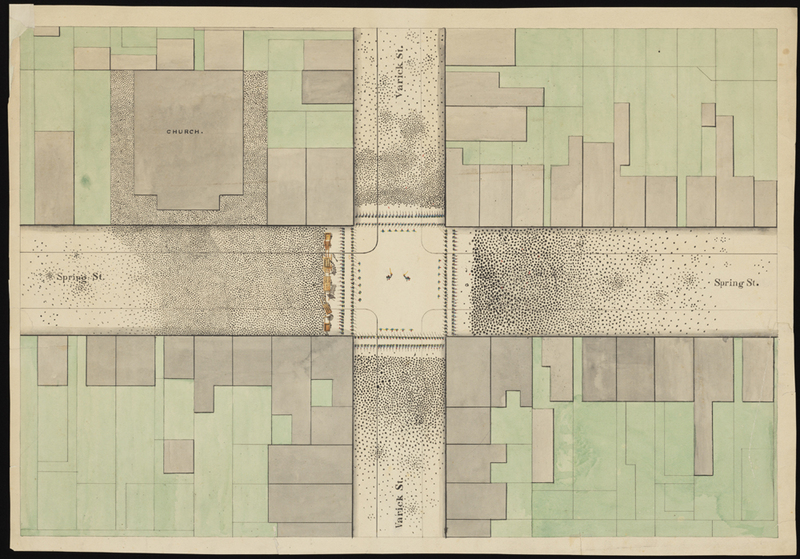 Inset, Map of Intersection of Spring Street and Varick Street, ca.1850, in the J. Clarence Davies Collection. Museum of the City of New York. 29.100.2984. 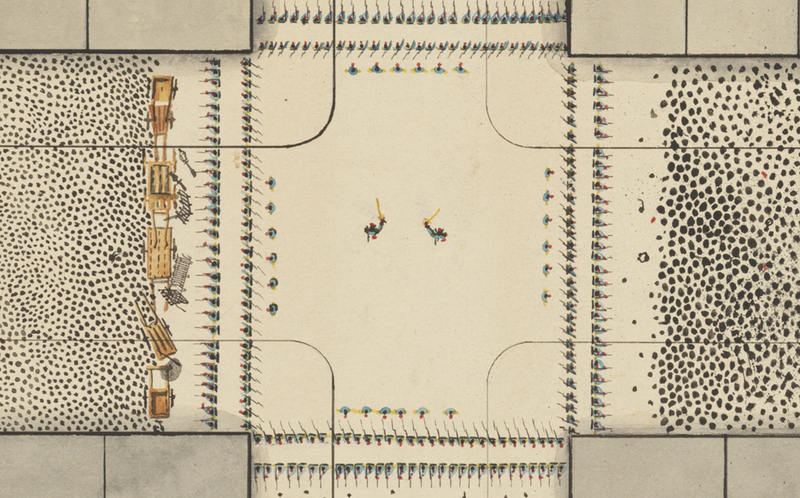 On closer inspection, it becomes apparent the barricade is made of carts, and in addition to the two figures fighting in the center of the streets, the intersection is completely surrounded by armed figures. Andrea viewed hundreds of maps throughout New York City’s repositories during the several months leading up to The Grid, and was equally perplexed by this map. Not too long after she’d completed her research for the exhibition, she sent me an excerpt from a book she’d found online, describing a “riot” in 1834, in which a mob attacked the homes and property of known abolitionists. The 27th Regiment was called in to disperse the mob, which had assembled in large numbers in the vicinity of Reverend Ludlow’s Church on Spring Street, between Varick and MacDougal, where they had amassed a barricade of carts, barrels, and ladders. 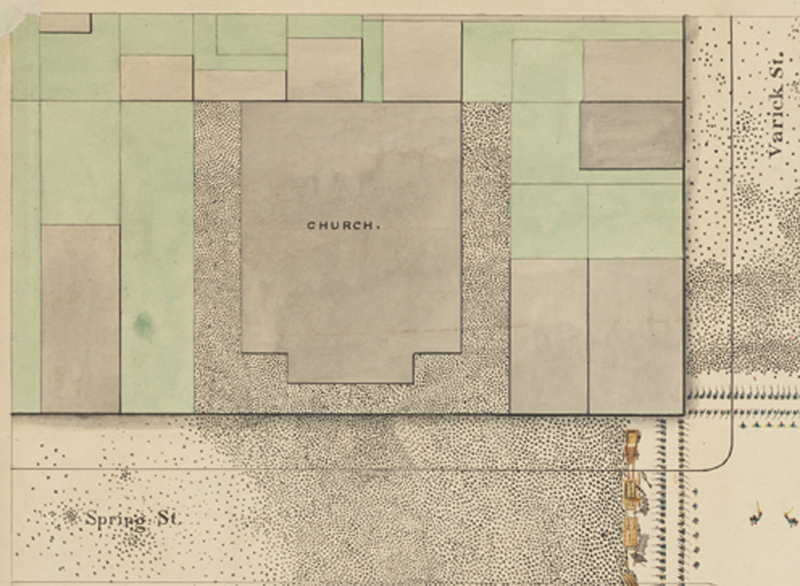 If you refer to the inset below, you’ll see the only structure identified on the whole map is an unnamed “Church,” which sits in the upper left quadrant on the image. (We think the tiny black dots are meant to represent individual rioters.) Andrea had identified our mystifying map. I consulted the ever helpful Gotham: A History of New York City to 1898, by Edwin G. Burrows and Mike Wallace, to learn more about this event. In July of 1834, several riots broke out, primarily incited by those – such as James Watson Webb, editor of the Courier and Enquirer; and William Leete Stone, secretary of the New York Colonization Society and editor of the Commerical Advertiser – opposed to the abolitionist activities of Arthur and Lewis Tappan, brothers involved with the founding of the American Anti-Slavery Association. In the days leading up to July 11th, the events of which are depicted in the map above, anti-abolitionist activities erupted throughout the city. On July 7th, anti-abolitionists descended on the Chatham Street Chapel, where a celebration in honor of the seventh anniversary of the emancipation of New York’s Slaves was planned. Three separate riots broke out on July 9th: The Chatham Street Chapel was once again a target; Lewis Tappan’s Rose Street Home was demolished; and four thousand people stormed the Bowery Theater, where a benefit was underway for George Farren, the playhouse’s British stage manager, a man known for his anti-Yankee sentiments. Over the next two days Arthur Tappan’s Pearl Street Store was pelted with stones; rioters stormed the Laight Street Church, where the Reverend, Dr. Cox had preached in favor of church integration; and later a group broke into Cox’s home on Charlton Street. Numerous other episodes of violence occurred, culminating in the swearing in by Mayor Lawrence of 1,000 volunteer constables, the deployment of the New York First Division, and all-night patrols by Calvary Squadrons. By Tuesday, July 15th, the riots had been suppressed. Love it! Great sleuthing and post. Very cool! I’m curious about the provenance of the map – who made it and who owned it when it came to you? Is there a personal connection between the riot and the map’s creation? Is your copy a hand-made map or was it printed? This map was donated to the Museum by J. Clarence Davies in 1929. The creator is unknown, and the map is a color lithograph. Thanks for your interest! Good job of tracking down the information! History unfolds in a single map image. Amazing. THIS is the power of an archival collection. Great sleuthing indeed. Hooray for Andrea! Like Kateroak, I am stymied: who in the world creates post-riot maps? For what possible purpose? And, remarkably, in quantities enough to merit lithography?? Perhaps I need to go down to Broadway and Liberty Street. This entry was posted on April 3, 2012 by Lindsay Turley in Manuscripts and Ephemera, Maps and tagged 1800s, 1830s, Abolitionists, J. Clarence Davies, maps, riots, slavery, SoHo.